A small minority of citizens today volunteer to serve our nation in the U.S. military, often putting their lives on the line. Where would any of us be today without these defenders of freedom throughout our history? A very important and long-overdue piece of legislation has been introduced in Congress that seeks to eliminate the catch in the educational benefits afforded veterans in the GI Bill, the most important "thank you" provided to those who have served. I encourage you to follow the link below to learn more and to take advantage of the easy online mechanism there to let your elected representatives know how you feel about this bill. I was contacted today by a Ph.D candidate/researcher at Stony Brook University in New York. He asked that we make available to our readers this opportunity to particpate in a national study of how people make sense of the information they encounter on the internet. The survey takes roughly 10 minutes or so to complete, and responses are completely anonymous. Participants will be eligible to enter a raffle for a $50 Gift Certificate to Amazon.com. Note: This study has been approved by Stony Brook University's Committee on Research Involving Human Subjects. "The Day After - Action in the 24 Hours Following a Nuclear Blast in an American City"
It was an initial report about a high-level government plan to prevent chaos in the wake of a nuclear terror attack on a US city or cities. Now, a thank you to Michael who forwarded the link to the actual pdf report coming out of that government/academic workshop entitled "The Day After, Action in the 24 Hours Following a Nuclear Blast in an American City"
It's well worth reading the report for the group's insights and recommendations, and a view into the future US position on nuclear preparedness for the population of the country. SHORT-TERM SHELTERING VERSUS PROMPT EVACUATION. Fallout shelters deserve a comeback. Radioactivity, and in particular radioactive fallout, poses a problem peculiar to nuclear terrorism. For most people in the city struck, their best bet to avoid serious radiation exposure would be to shelter below ground for three or so days until radiation levels had subsided and only then to evacuate the area. The alternative – mass and chaotic evacuation during the time when radiation dose rates are greatest – would result in large and unnecessary additional loss of life over and above the fatalities due to immediate blast, fire, and close-in fallout. But while sheltering in place is the plan that would be optimal for most people, it would run counter to their strong impulse to flee the area. For a comparatively few people just downwind of the detonation, moreover, sheltering would not in fact offer enough protection, and their only chance would be to leave as soon as possible, as fallout takes a finite time to reach the ground . Two distinct fallout regions can be expected. In the smaller, close-in “hot” fallout region the dose over time will be so high that most sheltering will not be effective and evacuation, dangerous as it is, should be attempted. That area is limited, however, to a few square miles in addition to the area affected by blast and fire. People in the hot zone should be advised to leave as soon as possible, preferably during the time before most of the fallout settles. But the great majority of the people will be outside the hot zone, and for them sheltering in place will be the safest course of action. In view of these facts, a new type of fallout shelter program – very different and much more practical than the 1950s-style civil defense program – should be promoted by the federal government as a cheap and effective way to minimize the radiation exposure of most people downwind of a nuclear terrorist attack. The Cold War “civil defense” shelter program was mocked because it could not offer realistic protection against an attack of thousands of warheads from the Soviet Union. But against one or a few terrorist nuclear weapons, sheltering in place is the best way for most people to protect themselves. The rate at which people are exposed to radiation (the dose rate) subsides in inverse proportion to the time after the blast. People outside the immediate downwind hot zone will receive a smaller dose of radiation if they shelter themselves for a period of three days or so (the recommended sheltering period can be determined and communicated by federal authorities at the time). If they try to leave on the first day when the radiation is strongest, they will receive a larger dose because they will be exposed to intense radiation as they walk or wait in traffic on clogged roads to evacuate. Shelters that will only be occupied for a few days do not need to be equipped with large stocks of food, water, and other supplies. The absence of the sheltering population from the highways will have another benefit: it will permit emergency workers and those who need to evacuate from the hot zone to move freely. A mass and confused exodus from the city will expose the fleeing population to unnecessarily high doses of radiation and impede the movement of emergency personnel. To avoid this, federal and state officials and first responders should work out ahead of time plans for determining which roads in the affected area should be closed to the public for three days and which should remain open and for how long. One way to persuade people to stay in shelters and off the roads would be to ascertain the direction of the fallout “plume” from the blast so citizens can be informed whether they are truly in the hot zone or not. Models at the Department of Energy’s national laboratories and the Defense Threat Reduction Agency, coupled with the daily weather forecast from the National Weather Service, can predict where the plume will drift and settle. A federal shelter in place program therefore should be accompanied by a rapid plume prediction capability. It should also be accompanied by a program of education for emergency workers and, to the extent possible the press, on the effects of radiation (for example, the fact that the dose rate subsides in proportion to the passage of time after the blast, see Recommendation 4 below). Even given better plans than now exist, putting those plans into practice will clearly be difficult and will require constantly updated communications to the public and all media as well as to first responders. Large-scale panic could lead to subsequent loss of life on a par with that in the detonation zone itself. Experience with previous wartime catastrophes shows that, with leadership and training, this unnecessary additional loss of life can be avoided. The regime heads in Tehran are basing their common front with Damascus on intelligence reports whereby the US and Israel have drawn up plans for coordinated military action against Iran, Syria and Hizballah in the summer. According to this hypothesis, Iranian leaders foresee the next UN Security Council in New York at the end of June or early July ending with an American announcement that the sanctions against Tehran are inadequate because Russia and China has toned them down. Therefore, the military option is the only one left on the table. The ayatollahs have concluded that US president George W. Bush is determined to bow out of office on the high note of a glittering military success against Iran to eclipse his failures in Iraq. They believe he will not risk the lives of more Americans by mounting a ground operation, but rather unleash a broad missile assault that will wipe out Iran’s nuclear facilities and seriously cripple its economic infrastructure. According to the Iranian scenario, the timeline for hostilities has already been fixed between Washington and Jerusalem - and so has the plan of action. The US will strike Iran first, after which Israel will use the opportunity to go for Syria, targeting its air force, missile bases and deployments, as well as Hizballah’s missile and weapons stocks which Iran replenished this year. Any mission is achievable when the QUEST is with you. Safecastle Royal buyers club members save $100 using their standard coupon, and of course get free shipping. 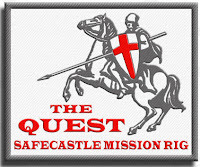 Existing club members also have been emailed a freebie offer in connection with this launch of the QUEST. History gives good reason for worry: In the past century, three flu pandemics have struck worldwide, and all came from avian strains. The most recent was the Hong Kong flu in 1968-69, which killed 34,000 Americans. In 1918-19, the Spanish flu killed 550,000 Americans. "Pandemics are like hurricanes, tsunamis and earthquakes. They occur," said Michael T. Osterholm, director of the Center for Infectious Disease Research and Policy at the University of Minnesota. "Even a mild or moderate pandemic would have tremendous implications." Osterholm said the dwindling public concern is a dangerous trend. In a serious pandemic, a third of the population could become sick. It would overwhelm not just medical services, but could slow or shut down many corners of the economy if workers were too sick to do their jobs. Yet, he noted, Congress passed an emergency spending bill last month that was stripped of $650 million for pandemic preparedness. "People just don't believe it is going to happen," he said. California's top health officials are taking the threat seriously. The state also spent $20 million to buy 51 million face masks, known as respirators, to protect medical staff working with sick patients. The disposable N95 filtering masks, manufactured by 3M of St. Paul, Minn., must be changed many times daily. State officials estimated as many as 100 million could be needed. According to Grant Barrick, product marketer within 3M's occupational health and environmental safety division, global demand for the respirators has been huge. Last month, the U.S. Food and Drug Administration cleared 3M's respirators for general public use in a health emergency. "We've been working almost 24-7 since the onset of this strain of avian flu to make sure we can produce the volumes needed," Barrick said. Di Blasi Portable, Folding Motorbikes - Never Be Stranded Again! Jim Rawles at www.survivalblog.com recently suggested that Safecastle get hooked up with the North American distributor of the famous Italian folding motorbike--the Di Blasi R7E. I looked into it and found that the distributor and I could mutually agree the fit was perfect. Folding motorbikes that can be stowed in a car trunk, on an RV, boat, or plane, or under a desk ... talk about being prepared! Fact is, we are now the only web-based Folding Motorbikes, Inc. dealer in North America! Until or unless we move the DiBlasi to a separate website, which is what we are considering, buyers club discounts of 20% apply, not to mention FREE shipping to the continental United States. So if this is of interest, the time to get your best price online is right now. See our Buyers Club listing. By the way, we've still got a few more really cool developments in the pipeline, so stay tuned!